Catering and environnementAs part of a global approach of reducing environmental impacts of the festival, we have chosen to serve all drinks in tumblers or glasses washable and reusable. We do not sell water in a plastic bottle at the bar. Drinking water is available free of charge at several points of the site. 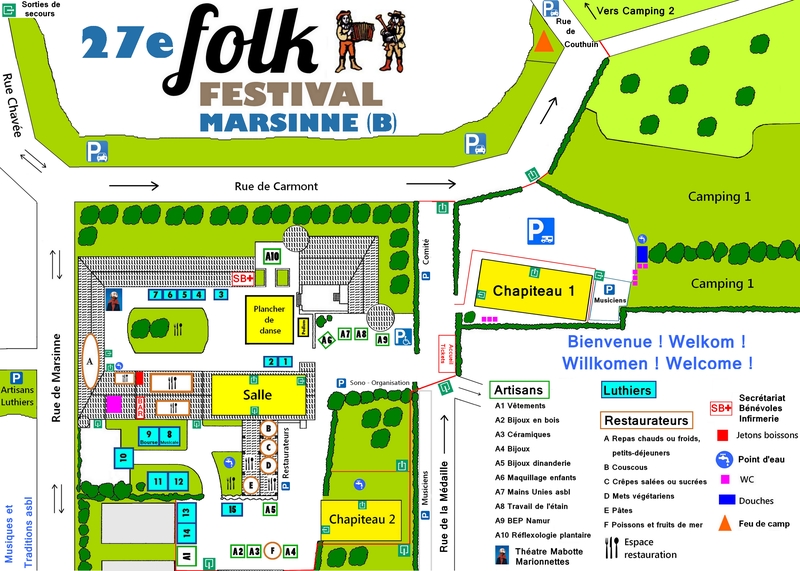 We invite you to support this initiative by buying a Festival de Marsinne water bottle filled with fresh water. The carabiner allows you to hang it easily to your bag for example. The caterers are committed to paying attention to the products they use and to the quantities of waste they generate. Dear festival-goers, participate too, by not leaving a crumb of all the tasty dishes and delicious preparations prepared by the caterers, as well as by throwing all biodegradable waste (disposable towels, cutlery, plates and other containers) into the green bins placed at your disposal on the site.